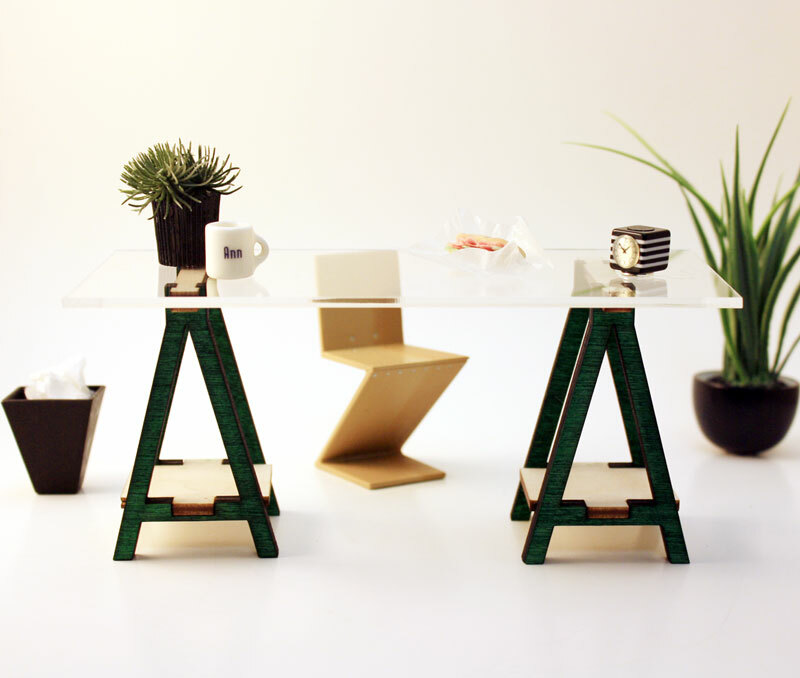 The VIKAesque wood kit is an affordable way to get a modern office desk for your dollhouse, customized to your specific tastes. And now after a few versions, it is refined to the point where it is super easy to assemble. Here’s how! The picture below shows all the parts you should have received in your kit. These are all the parts in the VIKAesque kit. 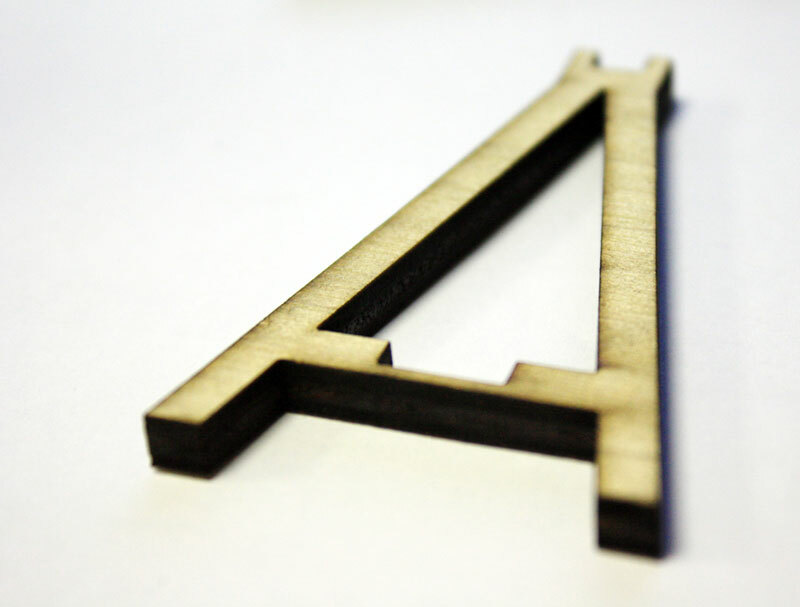 During the laser cut process, there may be some burnt patches or discolorations of the material from the soot. The burnt edges do have a certain aesthetic to it that some people may like and you are certainly welcomed to assemble it as is. Just keep in mind that the kit is meant to be stained or painted. Due to the discoloration from the laser cutting process, the kit is meant to be stained or painted. Also due to the nature of the laser cutting process, you may have to clean soot from the edges of the pieces. A very lightly damp towel will make quick work of the soot. Some cleaning of the soot from the edges may be required. After cleaning, you may want to paint or stain the pieces (here’s a quick tip on how you can stain the pieces with a marker!). I find it easier to do before assembly as it allows you to sand away any rough edges or paint/stain the various pieces different colors for a more unique look. If you prefer to paint or stain it after assembly, that’s fine too! Remember, there is no wrong way to do this! 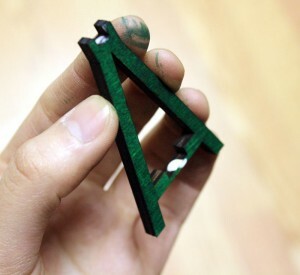 Other than however you decide to finish the piece, the only other tool you will need is glue. In this demonstration, I am simply using white Elmer’s glue (mixed with a bit of wood glue). NOTE: The type of adhesive is also dependant on how you finish it and when you finish it. 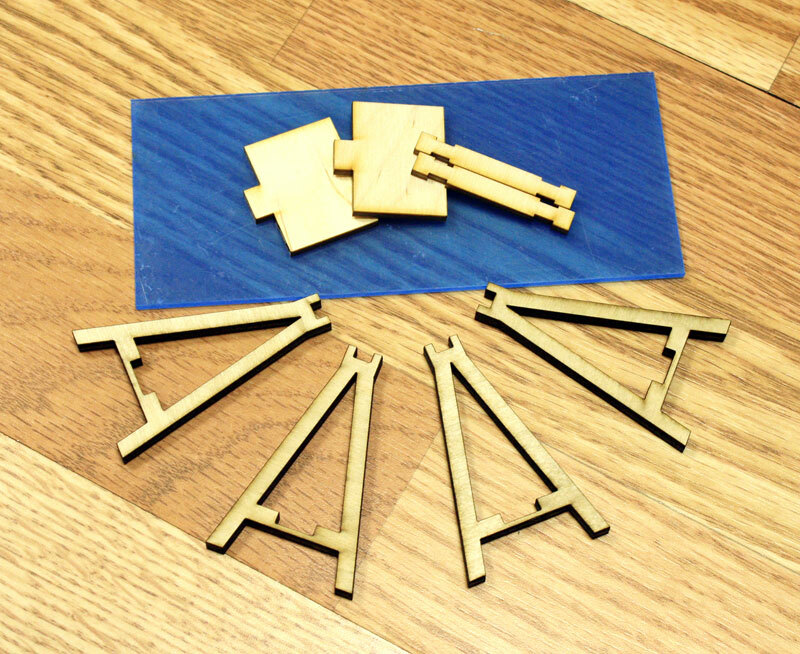 For example, if you gave the pieces a waterproof stain before assembly, wood glue might not create a strong enough bond, and you may need a water insoluble glue, like E-6000 glue. In another example, if you plan on finishing the piece after assembly, then any good old wood glue will do, as you will be gluing unfinished wood pieces together. The only tool you will really need. 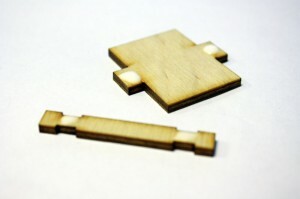 STEP 1: To start the assembly process, dab a bit of glue on the tab/slot areas of the connector pieces as shown in the image below. Just a dab on the connector pieces will do. 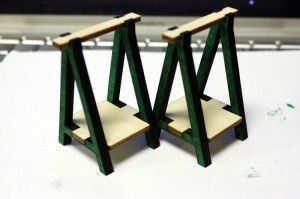 And/or you can dab glue to the tab/slot area of the trestle legs as shown in the image below. 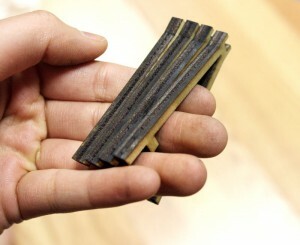 You can also dab some glue to the tab/slot areas of the trestle. STEP 2: With it glued, take the shelf connector piece and attach it to the trestle legs. I find it much easier to start at the bottom, with the shelf as it helps stabilize the leg. If you notice glue oozing out, wipe it away quick! Start assembly at the shelf area. STEP 3: Attach the top connector piece to the top of the legs. The top pieces have been tabbed so there is no need for measuring. Repeat step 2-3 with the second leg. 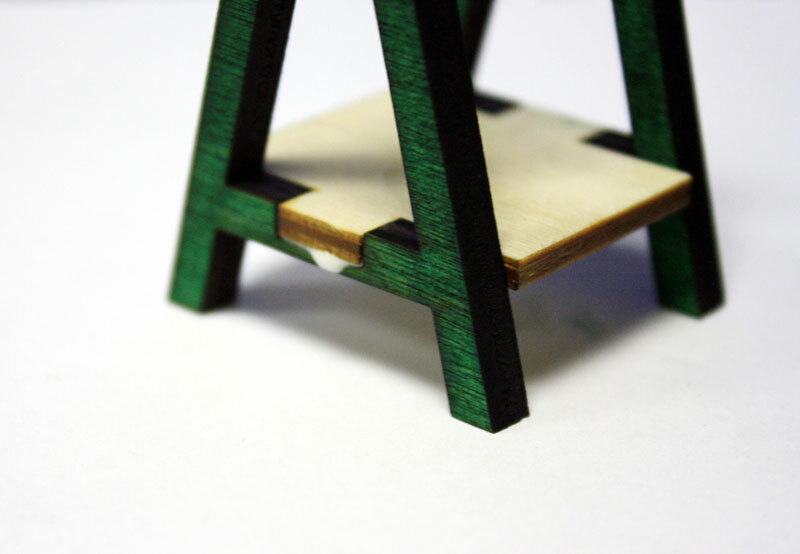 NOTE 2: Although the pieces are fitted fairly well, it doesn’t hurt to square it up with a small carpenter’s square so that the legs are squared properly! 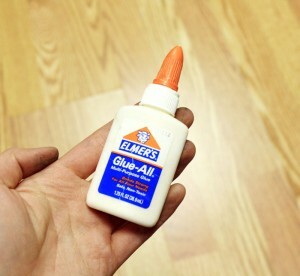 Let the glue dry for however long it is recommended by the manufacturer. Attach the top connector piece. We’re almost there. Now you just need to peel off that protective layer of film on the acrylic table top and place it on top of the legs! 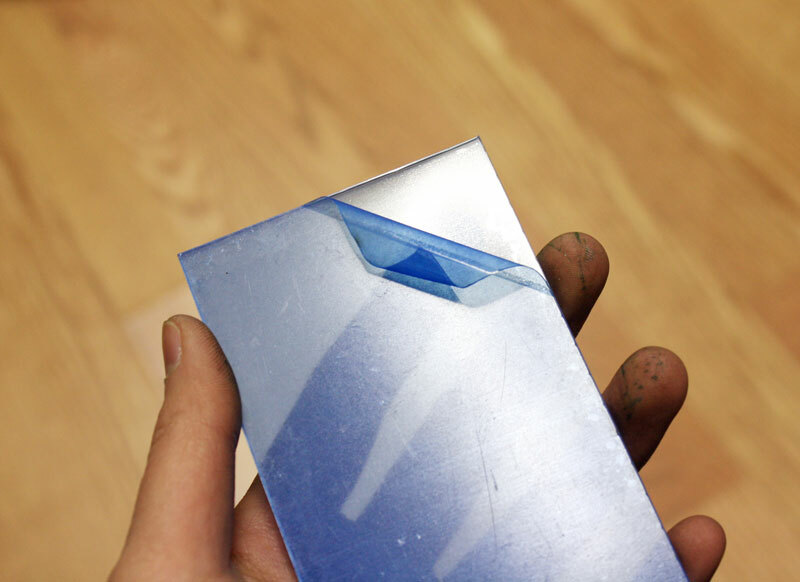 Peel off the protective film on the table top. So easy, even I can do it! Vikaesque Wood Kit. Photographs by Ann Nguyen. Sandwich by Snowfern Clover. Mug: unknown. Everything else by FranMadeMinis.